1. Cut the baby corn and sugar snaps lengthways on the diagonal and set aside. Heat a wok over a high heat until smoking, then pour in the oil and add the beef. Stir-fry for 2 minutes, then tip onto a plate. 2. Add the onion, garlic and chilli to the wok and stir-fry for 1 minute, then tip in the sliced baby corn and sugar snaps. Add a splash of water and cook for 1 minute. 3. Pour in the oyster sauce and 100ml water. Bring to the boil and cook until reduced to a sticky sauce. 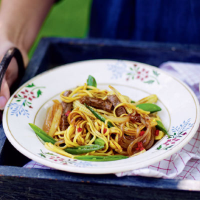 Stir in the beef, along with any juices from the plate, and the egg noodles. Heat through and serve immediately.